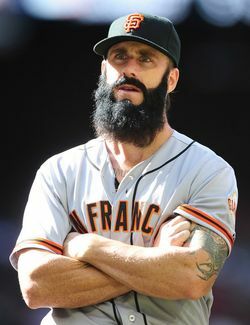 The Giants have non-tendered Brian Wilson according to Hank Schulman of The San Francisco Chronicle (on Twitter). Earlier this week we heard the team was likely to cut ties with their former closer. Wilson, 30, has saved 171 games for San Francisco throughout the years. He only appeared in two games this season before blowing out his elbow and requiring Tommy John surgery. Wilson earned $8.5MM this year and was arbitration-eligible for the fourth time as a Super Two. Matt Swartz projected him to earn the same salary again next year. Although re-signing with the Giants remain possible, recent speculation indicated Wilson could also have interest in pitching for the Dodgers or Red Sox. He makes his offseason home in Los Angeles and grew up in New Hampshire rooting for the Sox. If Ryan Madson's contract is any indication, Wilson is looking at a one-year, low-base salary, incentive-laden contract for next year.